For more than 40 years Boatel Party Cruises have built up an unrivalled reputation for celebration and corporate cruises. 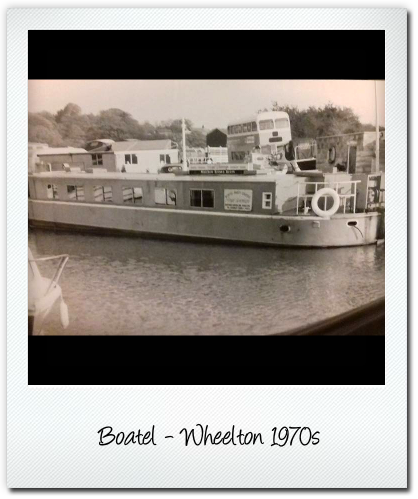 Being the first of its kind in the area, Boatel was the original party boat that started the trend. In 2019 we’re still going strong due to knowing what our customers want, word of mouth is our best advertisement with customers returning time and time again. Whatever the occasion, whether it be a 21st birthday, an 80th birthday, hen night, office party or just a get together with friends we will transform your occasion into a truly memorable celebration. The Royal Sovereign is a wide beam barge, not a narrowboat, and is one of the largest boats on the Leeds to Liverpool canal. Inside our central heated cabin you’ll find enough seating enough for 60 guests, a fully stocked bar serving draught, spirits, snacks and soft drinks. We have a dedicated hardwood dancefloor and DJ setup with full sound and lighting system. 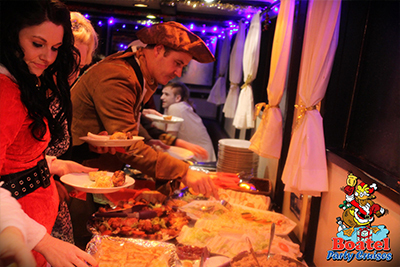 We consider ourselves a all-in-1 venue, meaning we don’t charge separately for sailing or food or entertainment. Everything is included under 1 price, all you need to do is turn up. Upon arrival you will be greeted by the Captain and shown to your seats. We have meal options ranging from hotpot, afternoon tea 3 course meals, right through to our succulent Officer’s Feast Buffet. Please see our different packages here. Once you’ve eaten, it’s a case of lights down, music up! Our resident DJ and compere will keep the dance floor filled playing party music and guilty pleasures to suit your crowd. Don’t forget the games and our famous Skippers Pot. 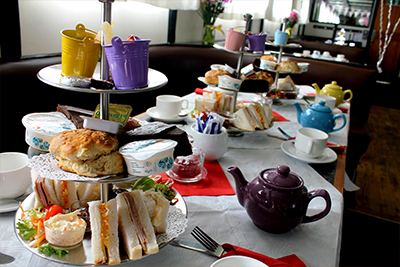 Of course not everyone wants a party cruise, so we also offer scenic cruises and afternoon tea cruises so you can relax and enjoy the Lancashire countryside.